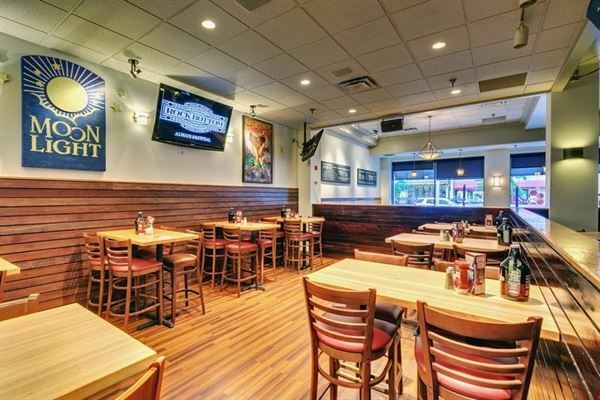 The Rock Bottom Restaurant & Brewery, located in the heart of downtown Indianapolis, is the perfect place for your next function . We can provide your group a casual experience in a comfortable entertaining atmosphere with a variety of unique food & ambiance possibilities - whether you are planning a corporate function, holiday party, rehearsal dinner, cocktail reception, meeting or reunion. We can entertain parties up to 500 and we'll cater to your every need. Designed around a working brewery, Rock Bottom is the place where great food, handcrafted beer and exceptional service all come together for an ideal gathering. Our restaurant can be rented out entirely or we have various private and semi-private areas including our billiards room "under the rock." Classic Plated Luncheon: $16 per person Includes unlimited coffee, tea and fountain sodas Choose 3 entrée selections Signature Plated Luncheon: $18 per person Includes unlimited coffee, tea and fountain sodas Choose 3 entrée selections One Dessert Classic Lunch Buffet: $25 per person Includes unlimited coffee, tea and fountain sodas Choose 2 entrée selections Choose 2 sides Signature Lunch Buffet: $30 per person Includes unlimited coffee, tea and fountain sodas Choose 3 entrée selections Choose 2 sides 20 Guest minimum for Buffets. Plated Dinners: The Kolsch: $27.95 - House or Caesar Salad - Three Entrees from Grilled Chicken, Angus Beef Tips, Cajun Pasta and Classic Mac 'n Cheese The Belgian: $32.95 - House or Caesar Salad - Three Entrees from 10oz Brewery Steak, Fried Chicken, RB Ale Chicken, Salmon Chimichurri and Classic Mac 'n Cheese. The Saison: $36.95 - House or Caesar Salad - Three Entrees from 10oz Top Sirloin Steak, Lobster & Shrimp Enchiladas, RB Ale Chicken, 10oz Brewery Steak, and Tuscan Chicken Pasta. - One Dessert: Carrot Cake or Triple Chocolate Brownies The Porter: $40.95 - House or Caesar Salad - Three Entrees from USDA Choice Ribeye, Grilled Smoky Chicken, Maker's Mark Bourbon Glazed Grilled Salmon, 10oz Top Sirloin Steak, Tuscan Chicken Pasta and Cajun Pasta. - One Dessert: Carrot Cake, Triple Chocolate Brownies or Mini Cheesecakes. Dinner Buffets (Min 20 guests): - All buffets include unlimited coffee, tea and fountain sodas BRONZE BUFFET - $29.95 per person - One salad selection - Two side selections - One hops selection - One dessert selection SILVER BUFFET - $32.95 per person - One salad selection - Two side selections - One barley, one hops selection - One dessert selection GOLD BUFFET - $38.95 per person - One salad selection - Two side selections - Two barley, one hops selection - One dessert selection See attachment for menu selection options.